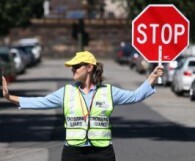 Crossing guards play a vital role in the lives of children who walk or bike to school each day. At the same time, the position of crossing guard is one of the most dangerous of municipal jobs due to slips, trips, and falls, and crashes involving motor vehicles. In an effort to address safety concerns for crossing guards and the children they cross, the Safe Routes to School Resource Center at the Alan M. Voorhees Transportation Center (VTC) at Rutgers University has been conducting research on crossing guard training in New Jersey and developing a uniform statewide Crossing Guard Training Program. With funding from New Jersey Department of Transportation and New Jersey Division of Highway Traffic Safety, VTC introduced the New Jersey Crossing Guard Training Program in 2013. Based on prior research, VTC developed the New Jersey Crossing Guard Training Manual for Supervisors, which forms the basis for the “train-the-trainer” presentation developed in 2013. Crossing guard supervisors participated in three train-the-trainer pilot sessions, which helped identify issues that were confusing or where conflicting guidance was given. Common issues included questions regarding crossing guards directing traffic, sitting at their posts, using whistles properly, and determining gap assessment calculations. VTC made changes to the manual and training program in response to participant questions and comments. The following report reviews results of the crossing guard supervisor pre-and post-training questionnaires and the pre- and post-training quizzes taken by the supervisors and the crossing guards. Lessons learned and next steps are summarized.